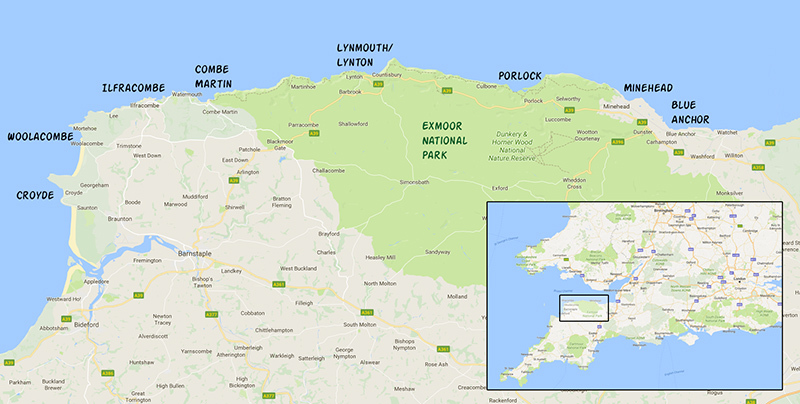 This is part three of our north Devon hike. Go to parts one or two. We hiked this section on a breezy but clear day. 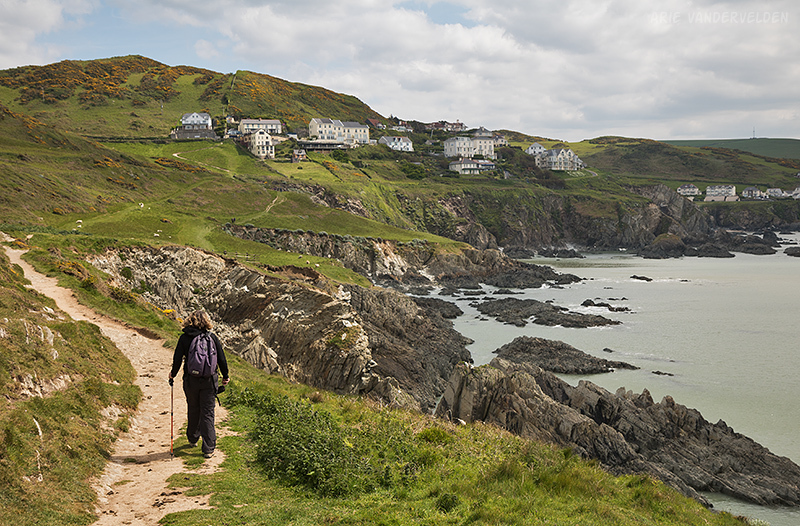 We started out from our hotel in Ilfracombe and headed to the hills northwest of town, where we crossed some grassy fields to reach the coastal path. Here we had some nice views of the coastal cliffs and the sea to the north. After a short while, the single-track hiking trail met up with a double-track jeep trail that led to the village of Lee. Lee is quite charming, but unfortunately the beautiful old hotel in the middle of the village is defunct. Looking back at the village of Lee. Beyond Lee, a single-track trail led up and down hills overlooking the ocean. 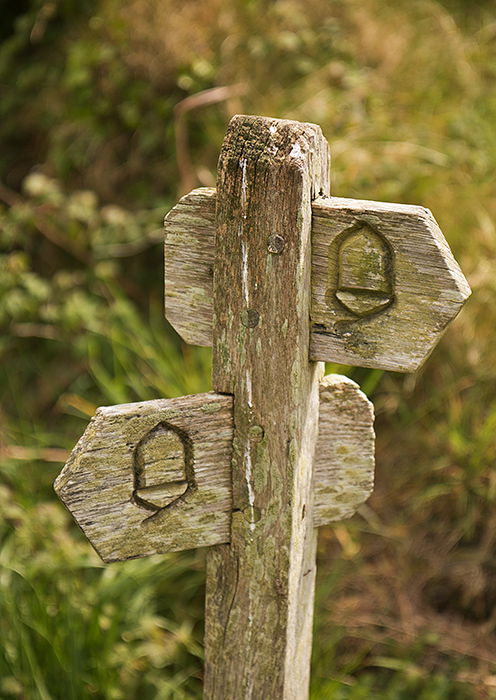 The trail led to Bull Point, where there is a lighthouse and a fog horn. 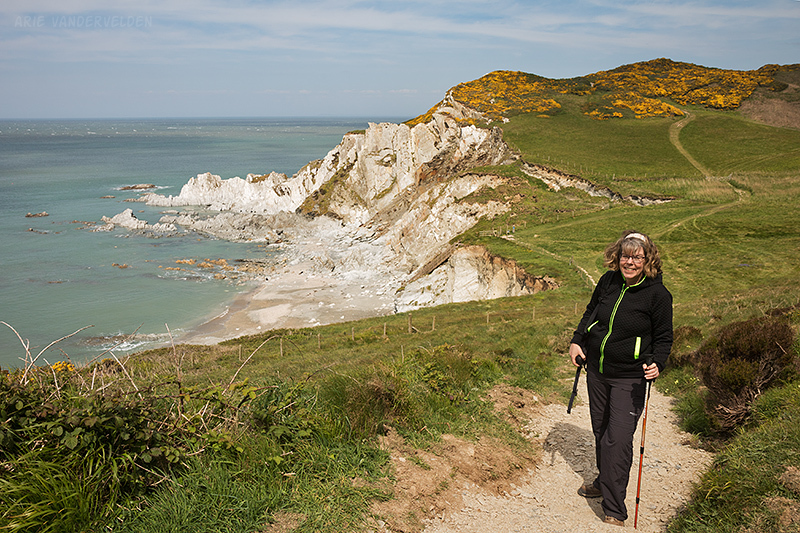 Beyond Bull Point the trail goes around Rockham Bay and heads to Morte Point. 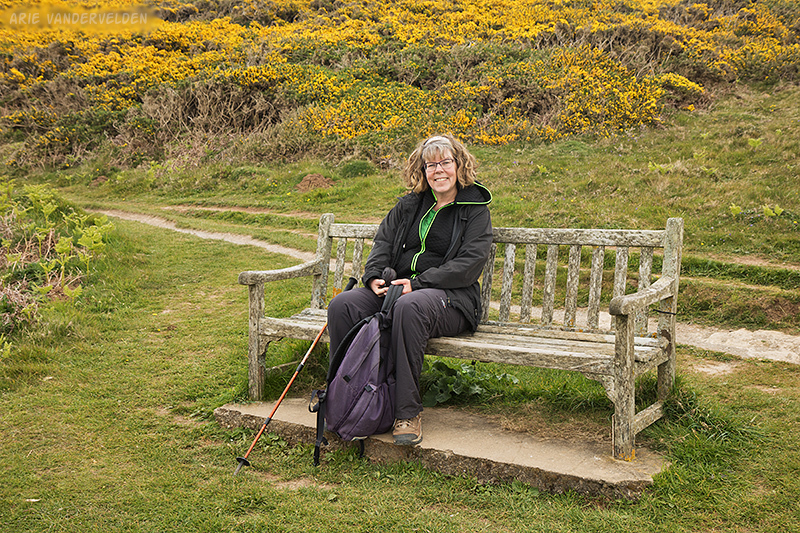 Lichen-covered bench at Bull Point. The way is well signed. Which way? Just follow the acorn. At Morte Point, beautiful grey Devonian slates jutted out into the sea. We were told by locals that there are some spots where seals haul themselves onto the rocks. We listened and looked, but didn’t see any seals. 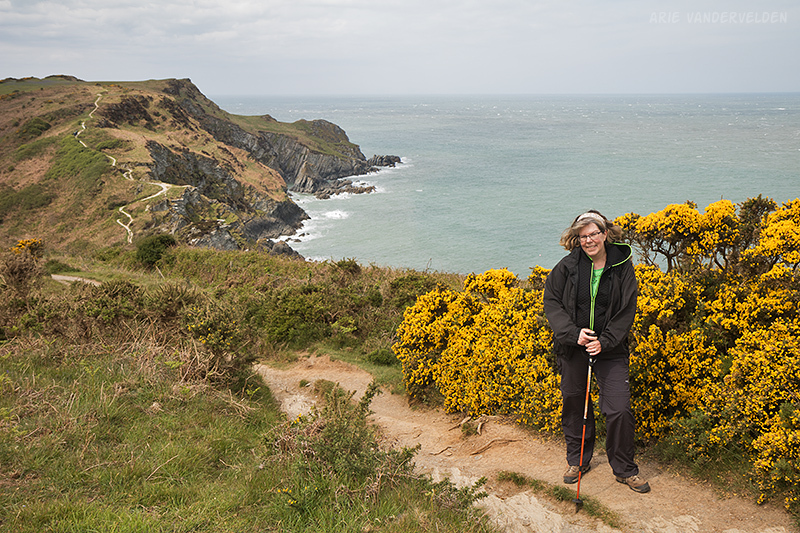 Diana takes a photo near Morte Point. Morte Point marks a transition in the coastline. Behind us, the east-west trending coastline faces the Bristol Channel to the north. Ahead of us, the north-south trending coast faces the Atlantic to the west. 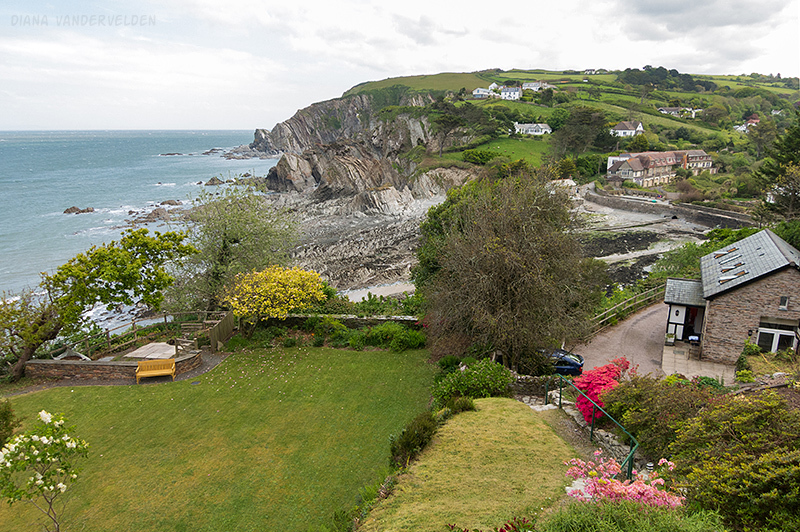 Behind us are tall coastal cliffs with small coves, and ahead are long sandy beaches interrupted by rocky headlands. 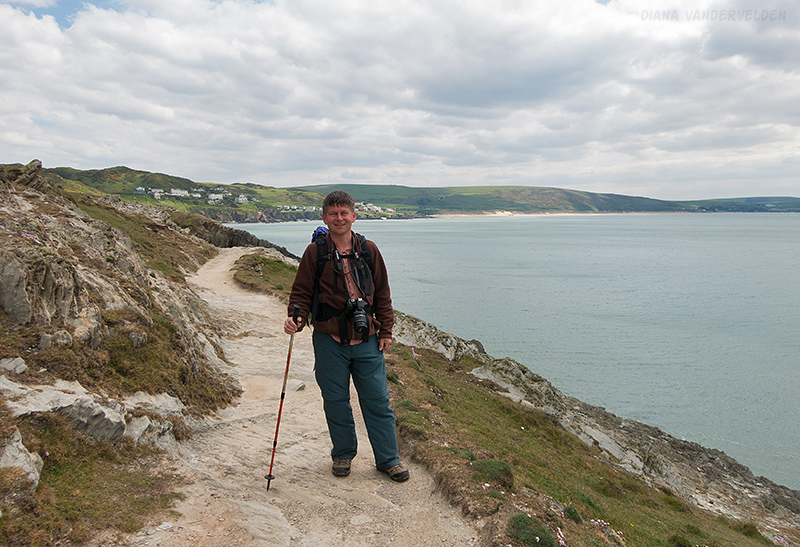 We rounded the point and started heading towards Woolacombe. Approaching the outskirts of Woolacombe. 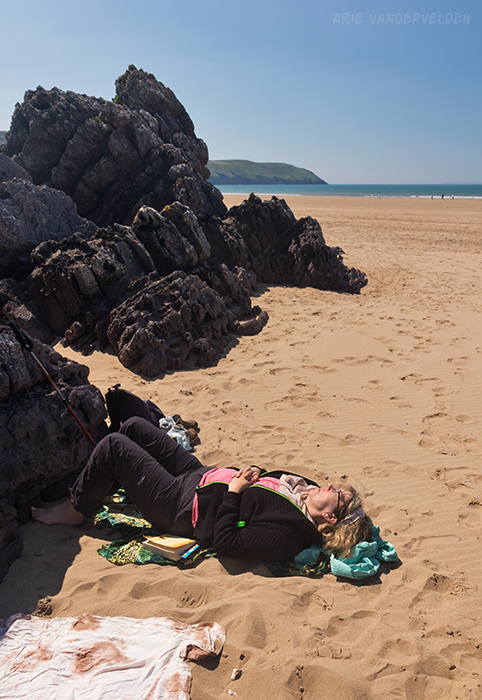 Woolacombe isn’t a particularly attractive place, especially when approached from the north. It’s a crass new resort town with construction cranes swinging, and behind it are huge vacation trailer parks. But it’s easy to see why it is so popular. 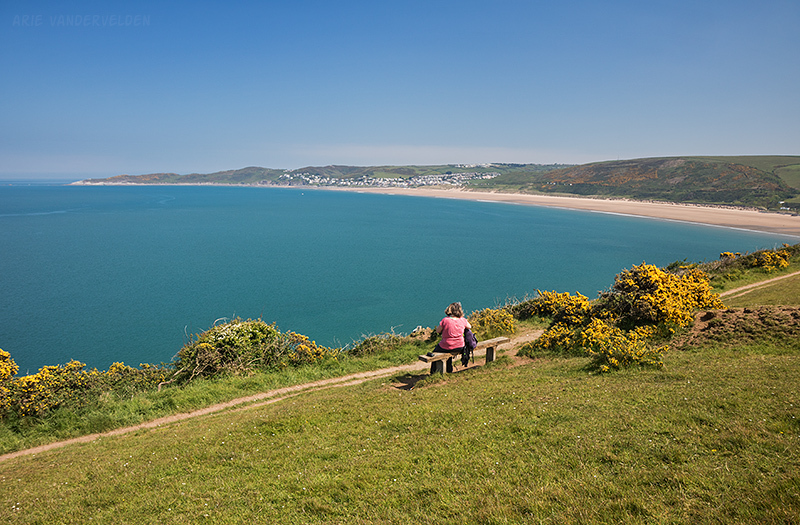 Woolacombe’s golden sand beach goes on for several kilometers. 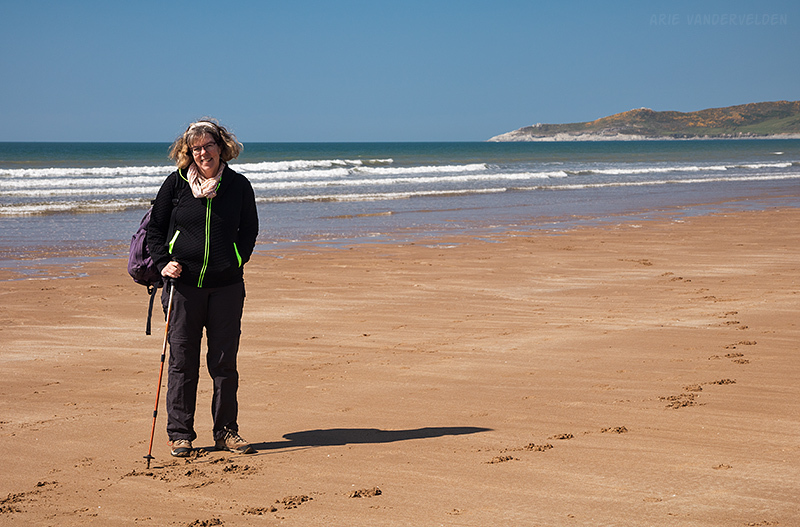 We hiked Woolacombe to Croyde as an out-and-back starting from Croyde. I’ll report here in the same direction as before, heading southwest, the way we hiked it in the afternoon heading back to Croyde. It was a beautiful sunny day with not a cloud in the sky. However there was a cool breeze. Near the south end of the beach we found some rocks that offered shelter from the wind. We stopped and had a snooze. 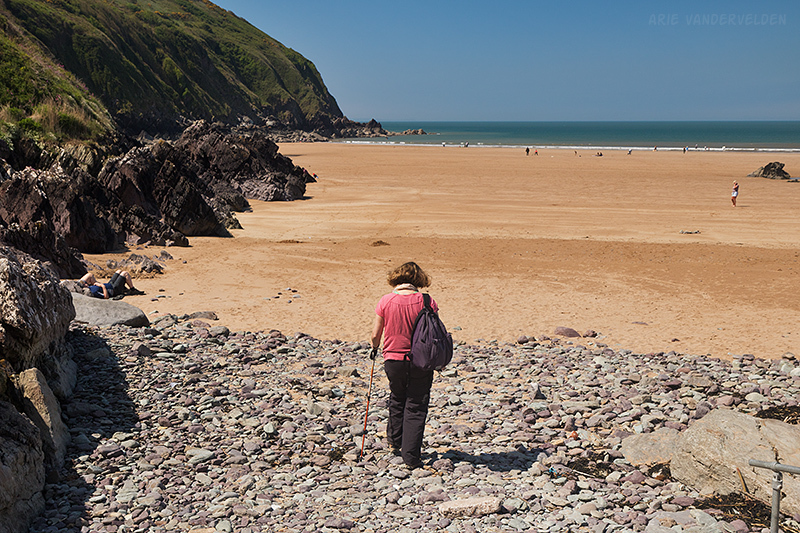 The south end of the beach at Putsborough is much nicer than the north end at Woolacombe. Putsborough Beach at low tide. 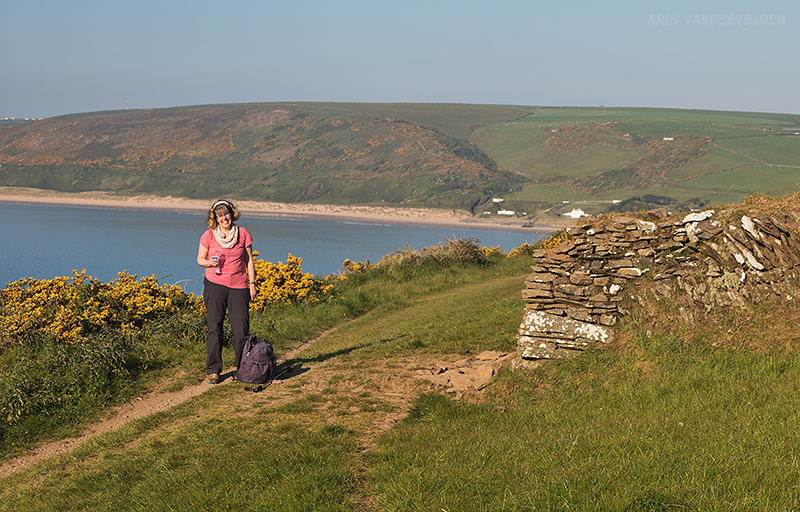 South of Putsborough is Baggy Point, a headland that sticks far out into the sea. 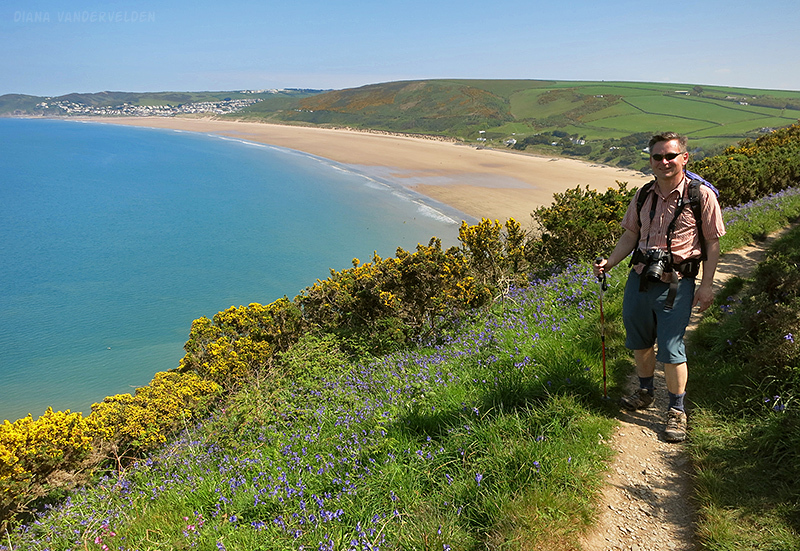 We found slopes overlooking Woolacombe/Putsborough Beach covered in bluebells. The yellow gorse shrubs completed the technicolor palette. South end of Baggy Point. 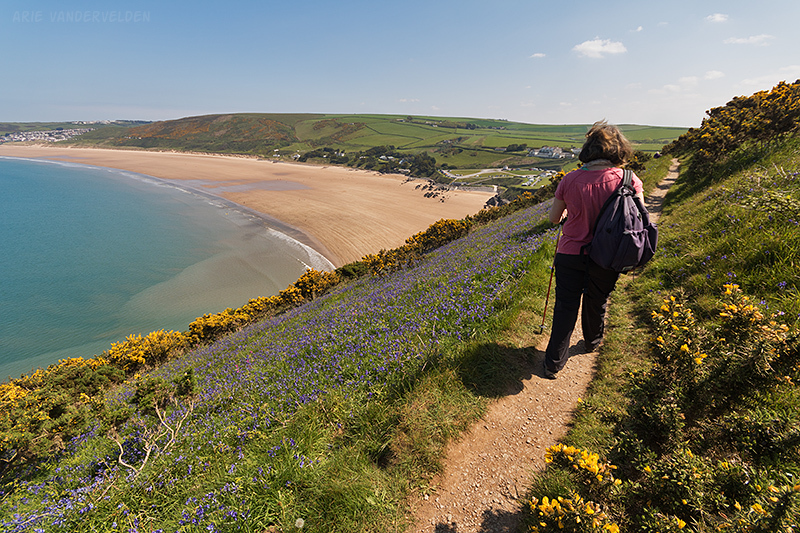 Bluebells, yellow gorse, green hills, yellow sand, and blue water. 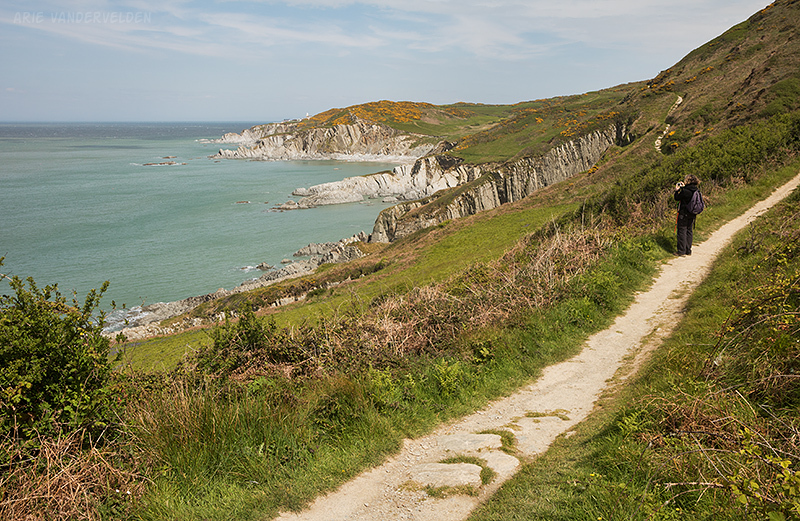 We took our time hiking around Baggy Point because the scenery was so beautiful. Stopping for a drink of water. 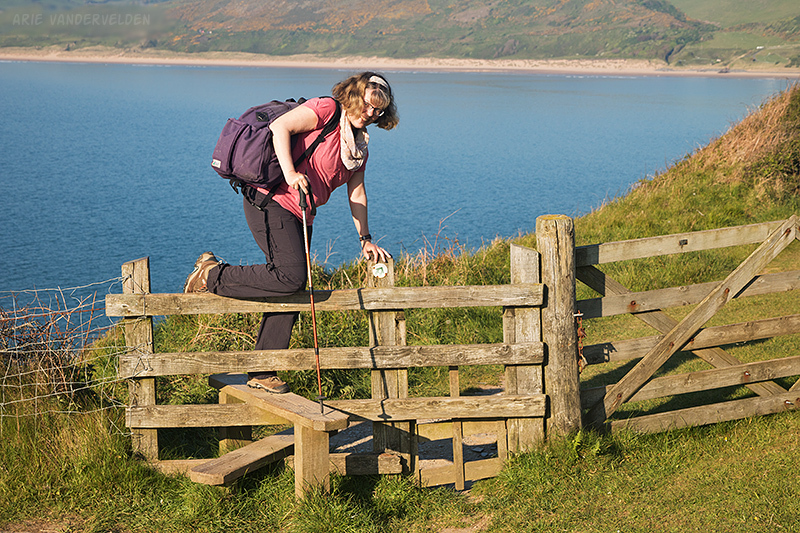 Along the coastal path there are many fences to be crossed. Farmers have constructed a variety of contraptions to make the gates people-friendly and sheep-proof. Climbing a fence. Notice the doggie gate at the bottom. It is operated by pulling up on the stick. We sat on a bench and enjoyed the fine weather. After a week and a half of unsettled weather, we enjoyed a bluebird day. What a wonderful way to end our hike. 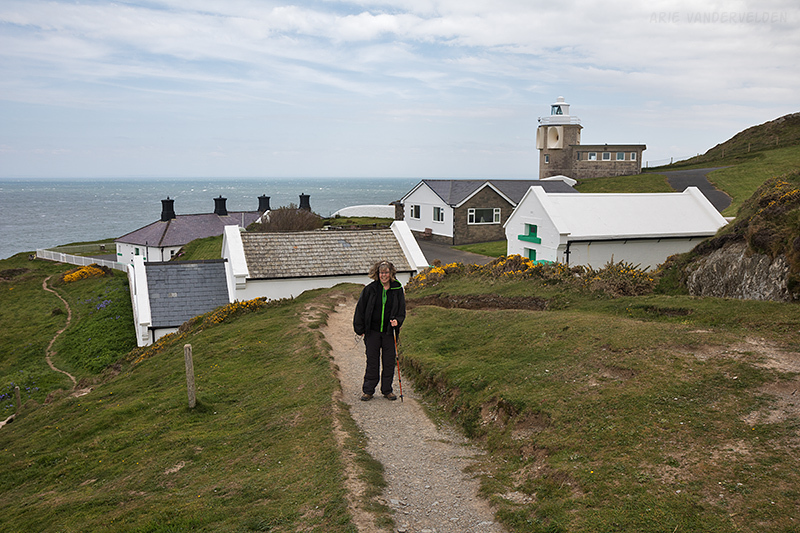 At the tip of Baggy Point. Note the sea kayak far below. But, the day was getting late and it was time to continue on to Croyde. 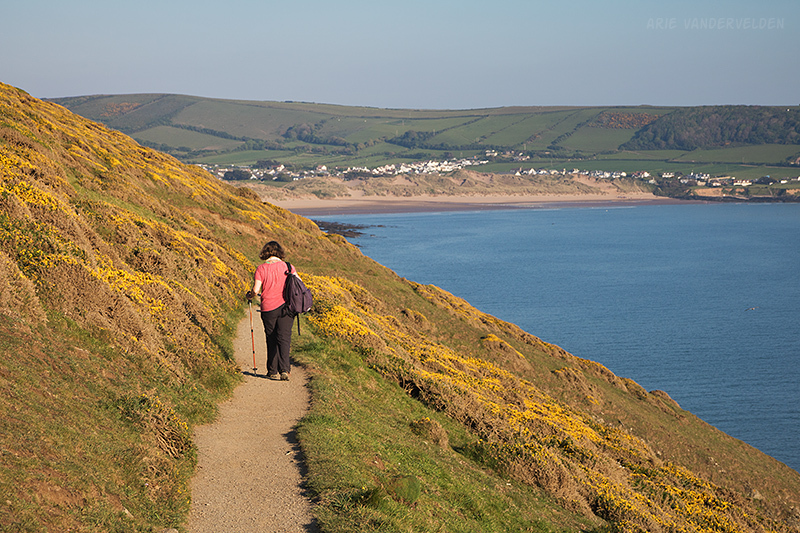 Hiking the last bit to Croyde. Croyde is a popular surfing destination. The sea was very calm and there was no surfing to be had when we were there. 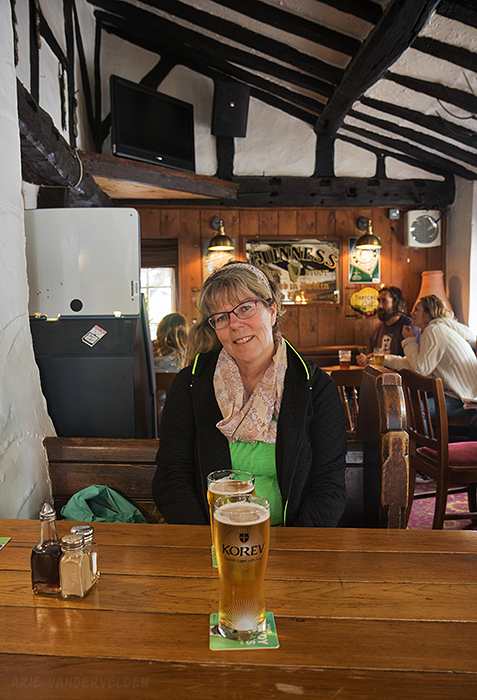 For us, this was the end of our hike, and we celebrated in the pub with beer and burgers. The trail does continue on around the River Taw Estuary and on to the city of Barnstaple. We’ll have to come back for that bit of trail! Enjoying a Korev in the pub. Croyde. 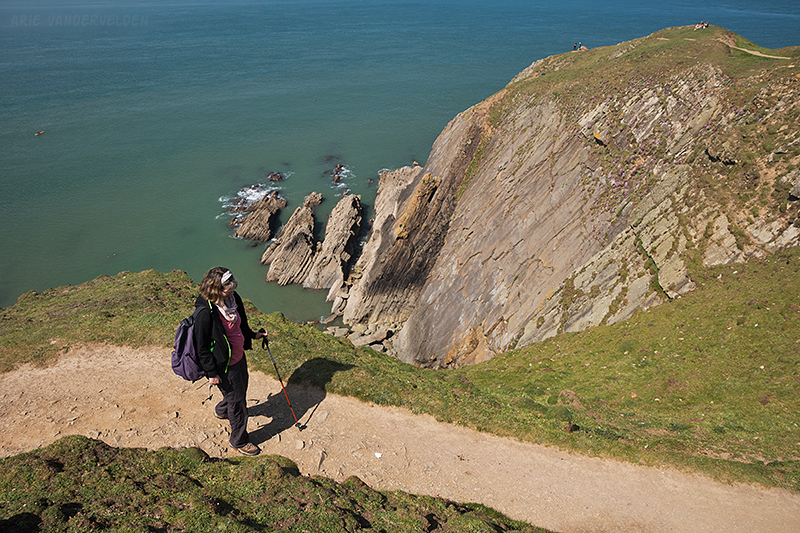 Find out how to organize a long-distance hike in Britain.